This product requires the base game Cities in Motion 2. Do you have a line with hard to please customers? Pavlov Arriva is small, smart and very comfortable to ride. Passengers are sure to flock to this one! Pretty average in every way. Not the best slogan, but the Sun is a well-rounded vehicle with decent capacity and speed. Decent for almost any route! When your maintenance capacity is under a lot of stress, Maurice Automaton is the vehicle to choose. 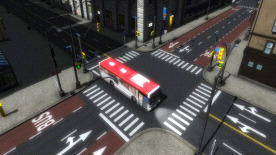 It has a sturdy structure and a low maintenance need, making it perfect for busy inner city routes with short intervals. Need more capacity? The Arnauld 202 has lots of room and then some! It's very slow, but with the large capacity still very useful for routes with lots of passengers. Not many passengers fit into a Stern-Berger ProTerra, but its energy consumption is so low it basically runs on air! This small but powerful vehicle is the top of the line when it comes to eco-friendly inventions. Cities in Motion 2 is required to play this DLC.